The Hart Memorial Trophy, originally known as the Hart Trophy, the "oldest and most prestigious individual award in hockey", is awarded annually to the "player adjudged most valuable to his team" in the National Hockey League. The Hart Memorial Trophy has been awarded 84 times to 51 different players since its beginnings in 1924. Each year, members of the Professional Hockey Writers' Association vote to determine the player who was the most valuable to his team during the regular season. Elmer Lach with the original trophy in 1945. The Hart Memorial Trophy is named in honour of Canadian Dr. David Hart. Dr. Hart, who donated the original trophy to the NHL, was the father of Cecil Hart, a former Coach and General Manager of the Montreal Canadiens hockey club. The Hart Trophy was first awarded at the conclusion of the 1923–24 NHL season. The winner of the first Hart Trophy was Frank Nighbor of the Ottawa Senators. The original "Hart Trophy" was retired in Hockey Hall of Fame in 1960, and the NHL began presenting a new trophy, which was dubbed the "Hart Memorial Trophy" in its place. 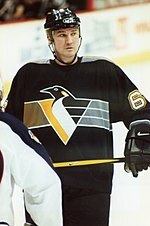 With the exceptions of Tommy Anderson and Al Rollins, every eligible player who won the Hart Trophy has been inducted into the Hall of Fame. 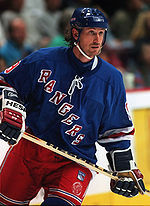 Wayne Gretzky won the award a record nine times during his career, eight consecutively. He has been named MVP more times than any other player in the history of the other three North American Major Professional Leagues (Major League Baseball, National Basketball Association, and National Football League). Barry Bonds is second, having won the MVP award seven times in Major League Baseball. Gretzky and his Edmonton Oilers teammate Mark Messier are the only players to win the Hart Trophy with more than one team. In 1990, Mark Messier took the Hart over Ray Bourque by a margin of two votes, the difference being a single first-place vote. Players from the Montreal Canadiens have won the award sixteen times; players from Boston Bruins are second with twelve winners, and the Detroit Red Wings and Edmonton Oilers have seen players win the award nine times. Joe Thornton became the first Hart Trophy winner to switch clubs during his winning campaign in 2005–06 NHL season, having played for both the Boston Bruins and San Jose Sharks that year. The voting is conducted at the end of the regular season by members of the Professional Hockey Writers Association, and each individual voter ranks their top five candidates on a 10-7-5-3-1 points system. Three finalists are named and the trophy is awarded at the NHL Awards ceremony after the playoffs. The closest the voting for the Hart Trophy has ever come was in the 2001–02 season, when Jose Theodore and Jarome Iginla tied in the total voting. The tiebreaker for choosing the Hart Trophy winner in such a case is number of first-place votes: Theodore, who had 86 first-place votes to Iginla's 82, claimed it. 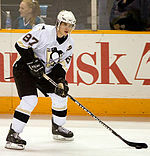 In 2008, NHL.com's official online shop came under criticism after they placed a T-shirt advertising Alexander Ovechkin as the Hart winner on sale a week before the winner was revealed. A spokesperson for the NHL said "in an effort to offer our fans the merchandise they want in a timely manner following an event such as the NHL Awards, our licensees prepare product for all possible outcomes. In this situation, the link for one of the possible products became live early through an error by our e-commerce provider." Ovechkin was later revealed to be the winner.